Another success from the fantastic BBC Good Food site. 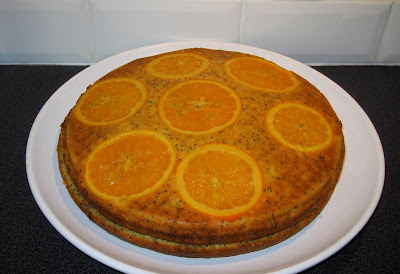 I made this orange and poppy cake which was really dense and deliciously zingy. 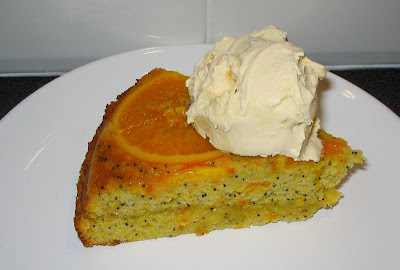 Syrup drizzled cakes are so good for serving as dessert especially if they are polenta or semolina based. This one isn't but the equal measure of flour and ground almonds make it a very close mix, ideal for holding its own with the syrup. The only thing I would do differently is maybe peel the oranges for the top as your fork would not go through it and you end up with an all manner of dinner table etiquette issues tackling the thing. Foods that are difficult to cut or eat evoke a mild anxiety in me as they transport me to a time where I was at a very lovely wedding held at a beautiful Royal Artillery mess (picture Harry Potter dining hall, long banqueting tables, massive candelabras and lots of fancy people). One thing about army dining is that all the cutlery is ancient silver and the knives are particularly blunt so tackling a piece of meat needs some serious planning and precision. They had sat me next to the vicar, so the combination of trying desperately to appear sober, to not say anything controversial or blasphemous as well as using what may as well have been a spoon to cut my meat was a disaster waiting to happen and oh my... happen it did. After trying to saw into the meat for what seemed like an eternity, the knife slid along the plate, launching practically the entire contents in the direction of the vicar. Most landed in his lap apart from a whole new potato that leapt up and hit him square on the head. I cringe at the image of him mopping gravy off his brow as the section of room fell silent before being shattered by my friends roaring laughter to the utter horror of the brides family. The vicar and his wife left shortly after and didn't hang around for dessert which was probably a good thing as the tradition for the army chaps I was with is to eat it sans cutlery, with hands behind backs and the dessert that evening was a mousse served in a thin champagne glass which required a bizarre sucking and licking action. I have never been seated next to a vicar since. So please peel the rind off the orange.